We sell a unique and interesting experience/product which makes for a great gift and gift certificates make up 16% of our sales. Last December that jumped to 54% of our sales as we sold more gift certificates for Christmas. We're wanting to beat that performance this year so I thought I'd post our plan here and ask for your feedback and ideas. Any thoughts and ideas are very welcome in the comments. Get in touch with men's magazines and online publications, most of these will run gift guides in the lead up to Christmas and it would be great to be published in those. 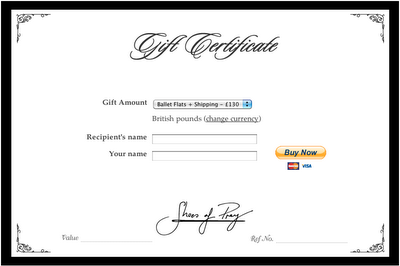 Offer them Shoes of Prey gift certificates to give away as part of a promotion. Which men's publications do you read and you think we should contact? Please let me know in the comments. And if you have contacts you could introduce us to that would be fantastic. We're about to hit 28,000 fans on our Shoes of Prey Facebook page. I'd love to come up with a promotion that encourages those fans to spread the word about our gift certificates. Run a promotion to win a Christmas gift certificate and ask people to post a link to the design they'd order if they won? Any other more creative ideas? It doesn't encourage spreading the word but we could run a promotion where 1 in 10 people who buy a gift certificate for someone else win one for themselves. Not sure how that sits with the fact we don't discount, but I think that might not devalue the brand if messaged in the right way. Alternatively we could offer a free belt with every gift certificate purchase (we had some made up recently). 1. A better photo targeted to men. Perhaps an attractive female leg/foot with a brightly coloured shoe. 2. 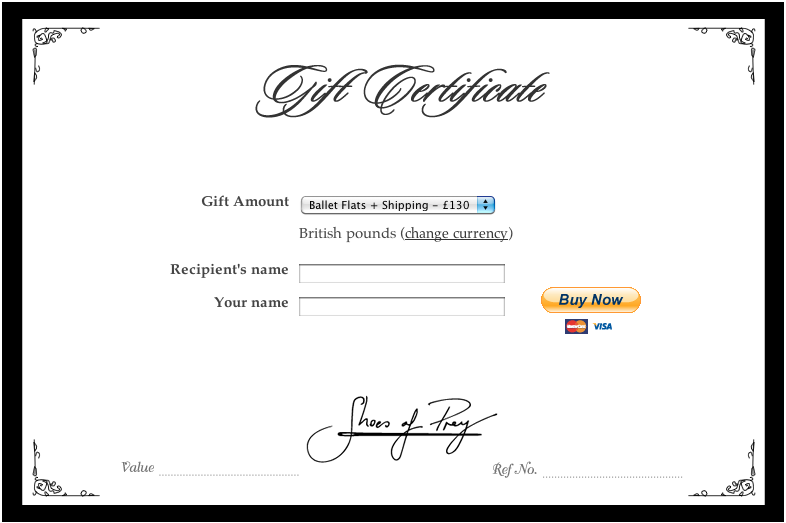 A version of our Facebook gift certificate page on our website. The advantage of this is we can then modify the headline in our ad rather than being stuck with 'Shoes of Prey' which men may not recognise, when we point to the gift certificate page on our Facebook page. The downside is that we lose the social element to the ad. An A/B test is required to see what works better here! I've optimised our Google AdWords account and added in some more gift certificate related keywords, and increased our bids on gift certificate related terms. The panels on our home page allow us to swap different images in and out and about 50% of the time we have a gift certificate promotional panel up. We'll keep that up 100% of time between now and Christmas. We get a good amount of PR and do quite a few interviews with business and fashion publications. We should mention the fact we do gift certificates in those interviews to spark the idea of buying one with potential customers. Our current gift certificate page is very basic, it doesn't promote the gift certificates and explain why it's a great idea to buy one. We should create a second page and A/B test it. Any thoughts on the above plan? Anything else you think we should do? Assuming a database of past customers, an old fashioned newsletter offer? Occupy 'SoP' promo for FB? 1. Email newsletter - good idea, should have had that one on my list! 2. Indie Christmas is an interesting concept, will give that some thought. 3. Haha, not sure if people involved in the real movement might take offence but I like the concept! A general comment Michael - for the mobile version of the site, could you please put an archives button, linking to older posts? I recently stumbled upon this amazing site (and am now hooked), but trying to find them means I have to connect to the full site, then search via the general archive section. (Egg on my face if there is a button and I'm too blind to see it. Anyway, as a digital marketing professional and budding entrepreneur, your site is really inspiring and a welcome break from the day! Thanks! Long time reader, first time poster. First off just wanted to thank you for posting so much great information, truly inspiring for aspiring entrepreneurs trying to enter the e-commerce world. We were talking about email campaigns for our our e-commerce site today, and I thought that it might be cool to send out an email blast that that was less of a pitch. Like an Xmas card "Just wanted to say Happy Xmas from the Shoes of Prey team!" or "Its been a while - how do you like your shoes?" with no pitch. My email inbox, as well as many others I assume, is inundated with sales offers (flash sale sites, groupons, etc) it would be refreshing to see something else that could build customer loyalty / awareness and thus drive long term sales. What do you guys think? 2. Large Corporates - Big 4 accounting firms/large law firms/large funky companies (google...??) will be looking for unique ways to reward their staff at Christmas time - why not pitch them on a Shoes of Prey gift/corporate experience for their staff on a worldwide basis - PWC alone has 168,710 staff worldwide! EY has approx 150,000...even though the chance of take up is limited, it is a big reward if you manage to strike a global or even a national deal. 3. Viral Youtube Video - though hard to create, something that taps into the male psyche would be fun (cross dressing immediately comes to mind as does the common theme of men being out of their depth when choosing female products as does men forgetting significant occasions as does short men feeling inadequate next to high heeled women)..not sure how you would tie it all together but I think it's at least worth a story board to see whether you can come up with something original! Even if it isn't used this time around, perhaps when marketing dollars are in abundance you can use it then! At the moment it seems that the overall aim of your marketing efforts to date is to increase the number of gift certificate purchasers. However, in general, I feel that there is a level of negative sentiment in the community which casts the giving of a gift certificate in a negative light. They think it may imply a lack of care or thought or a lazy approach etc. That got me thinking, what if you rethought your entire gift certificate approach by adding accoutrements that would make it a) more tangible at the initial act of gift giving and b)more experience based as opposed to a design activity. Let me explain: a) could be achieved by allowing purchasers to select a physical gift of flowers or confectionary or a bottle of champage or a belt or similar fashion accessory (maybe with a suggestion that she now needs to design shoes to match...you may even be able to link in with sneaking duck and offer frames and shoes) which accompany their gift certificate b) could be achieved by allowing gift certificate holders to send in a picture of an outfit and the customer could receive free fashion advice from Jodie or similar over webcam or if they are Sydney based you could even offer for them to come into the studio. I'm not so confident in my b)suggestions as they seem to be time consuming (but you get my drift). However, with respect to my corporate targetting suggestion above, it may assist that you would be willing to come out to meet with all of the PWC employees in the Sydney office to talk fashion and bring fabric swatches etc. Anyways, I've got a cup of tea on the brew so I best be going. In summary, perhaps augmenting the original offer is the key? 1) You should "hand write" the gift certificate message to make them more personal. 2) You should run a competition on Facebook to get 28,000 people engaged to post their "Wish list" design on the wall and give away $1000 and a pair of Shoes delivered in time for Christmas to a favourite design selected by the team - put a 7 day deadline on it so people response quickly. 3) Email newsletter will cut off dates for guaranteed delivery for Christmas? Customisation takes time... You would get early dates if you did this. You probably get a lot of Gift Certificate orders around Xmas because it takes 4 weeks to get a pair of shoes so its not a product that can be purchased at the last minute. I'd be thinking about how you can get sales in the next 2 weeks and land them in customers hands by Xmas, and promoting that. Justin - Glad you like the blog. Alas we use Blogger to host it so I don't think we can make the adjustments you suggest to the mobile version of the site. We've been contemplating a switch to a different platform as Google don't seem to be investing much in Blogger but it's not top of our priority list at the moment. Alex - Thanks, that's a good suggestion, I agree that would be a nice email to receive. We don't like to be overtly salesy so fits nicely with our brand too. Brad - All good suggestions. We do indeed handwrite the gift certificate when we send it to customers, though we don't include a personalised message from the gift certificate giver on it, that could be nice for a future version. I think something along the lines of your Facebook page suggestion might be the way to go. Most people give a gift certificate on Christmas day and the recipient orders their shoes after Christmas, so delivery dates are not such an issue.